Breathtaking foliage, mouthwatering wine and pumpkin carving… Is there anything not to love about the fall season? If you enjoy all these autumnal sensations, then perhaps the best way to immerse yourself in seasonal delights is to visit one of the many national festivals dedicated to its magic. 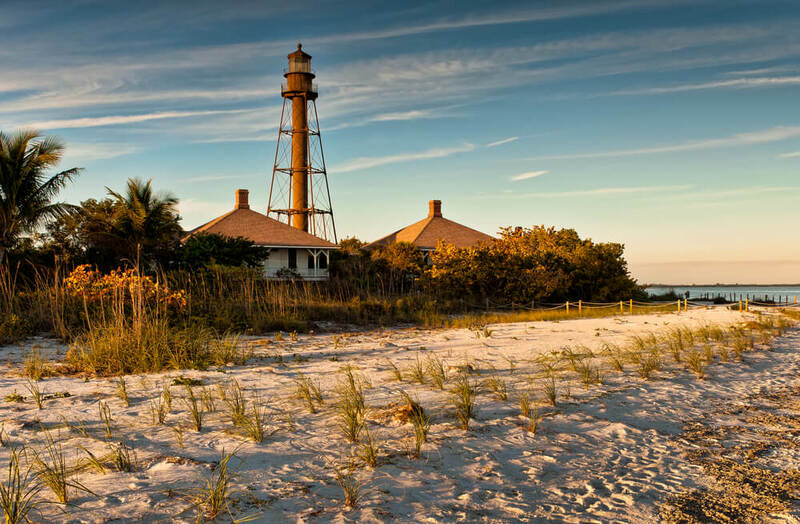 Luckily, there is no shortage of interesting and entertaining festivals from coast to coast that will be sure to suit every type of visitor. From hearty harvest celebrations to exquisite gastro events to trendy desert-set music festivals – here are some of the fall time festivals you need to check out in the season ahead. With fall comes Thanksgiving, and with Thanksgiving, the sweet, sweet taste of cranberries. Well, if are curios to see how this juicy berry travels from farms to your dining table, then you sound like an ideal candidate for visiting the Cranberry Harvest Celebration, an annual event which takes place every October in the town of Wareham in Massachusetts. Not only will this festival give you a convenient excuse to visit New England – one of the most beautiful regions in the country when it comes to autumnal palettes – it will also delight you with all other kinds of festivities dedicated to this delicious symbol of fall. 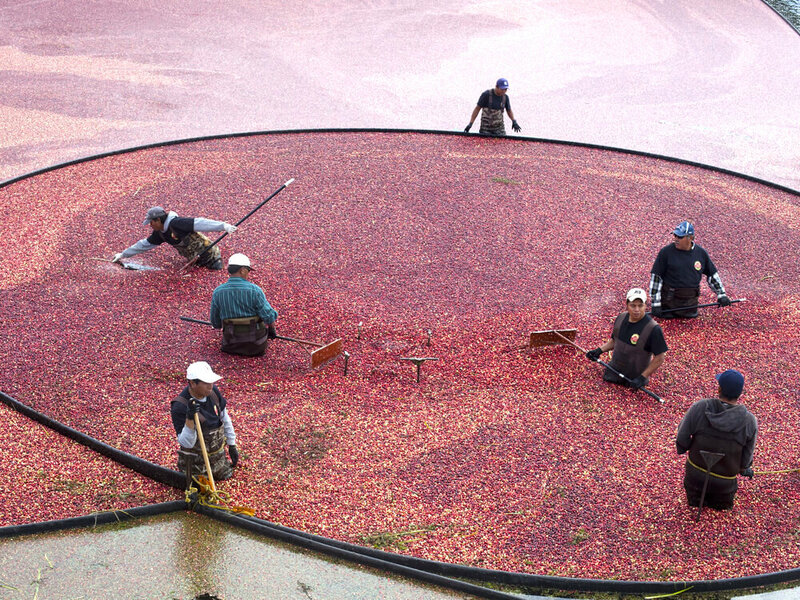 The focal point of this festival is the cranberry harvest, which is a spectacular visual sight in its own right. Visitors get the chance to observe the vast crimson fields in their full splendor; those who want to get an even better view can even book a helicopter ride from the local tour operators. On the ground, you will find a diverse program, including live cooking, music performances and other exciting activities. 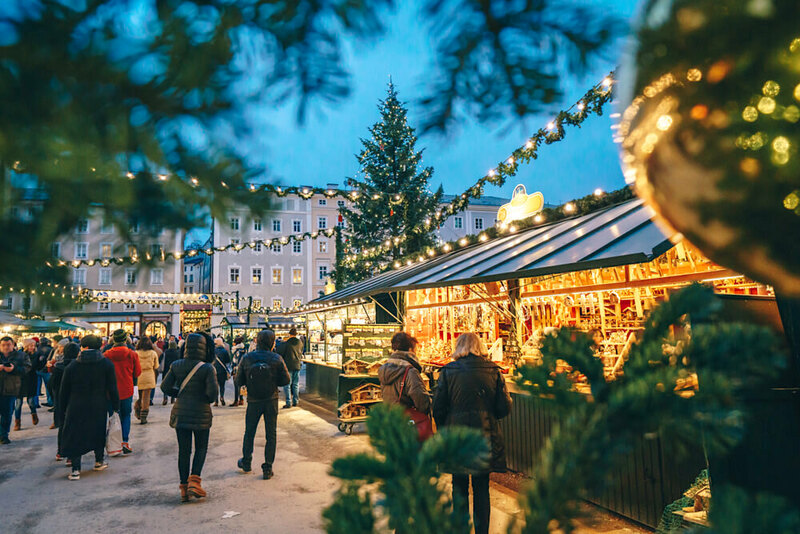 The festival also hosts a boisterous marketplace, where you can get your hands on one of the many cranberry-infused delicacies and other kinds of seasonal treats. The little ones will also have a whale of a time at the Cranberry Harvest, as the children’s area comes equipped with wagon rides, ponies, paddle boats and much more. Despite being the city’s second most famous festival (after South by Southwest), what Austin City Limits has to offer is nothing to be sneered at. Taking place over the course of two weekends in October, this rich celebration of music and arts hosts eight stages, where visitors can get a chance to see a wide variety of acts, from local indie bands to fully established hip-hop and rock’n’roll titans. When it comes to music, Austin City Limits’ line-ups have always delivered big names and immense performances ever since its inception in 2002. Some of the past headliners include well known and well-loved acts, such as Radiohead, Paul McCartney, Metallica and Kendrick Lamar. Other than strong and diverse headliners, Austin City Limits also operates an area for showcasing the richness of the local dining scene, under the name Austin Eats. In this gastro-oriented spot, visitors have an opportunity to sample the immense palette of the city widely known for its exciting dining scene. The festival also holds a lively art market, where visitors can get to see works made by local artists and creators. 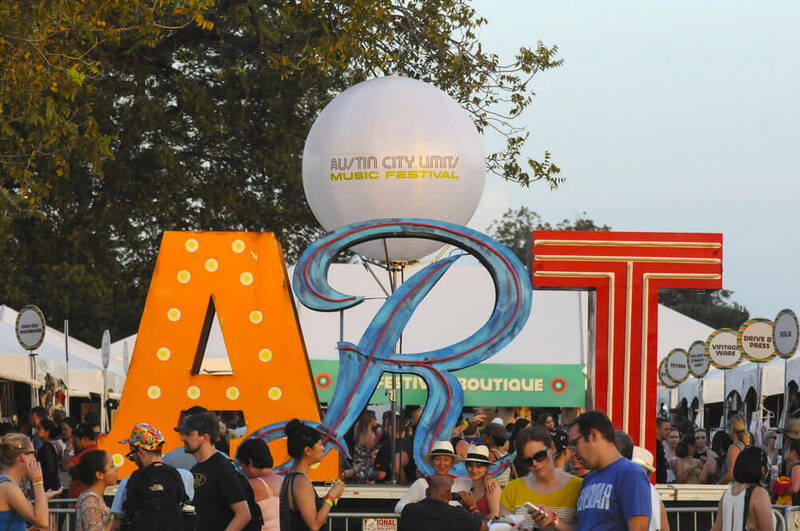 At the Austin City Limits, you will also find an area dedicated to local community, where festivalgoers have a chance to learn about local causes, but also find out how to support them. Finally, Austin City Limits hasn’t forgotten its youngest visitors – the grounds hold a designated children’s area, where even the little ones can also get to enjoy the magic of Texas’ vibrant music festival. If you are in a mood for a somewhat atypical fall festival, then jet off to Hawaii, where you will receive a warm welcome into a vibrant ceremony known as the Aloha Festivals Floral Parade. This exuberant event takes place every September in the Hawaiian capital of Honolulu. The color-packed procession starts at the Ala Moana Beach Park and runs through the Kalakaua Avenue before ending in Kapiolani Park. During the festivities, visitors have a chance to see beautiful floats adorned with flowers native to the islands, as well as Hawaii’s traditional pa’u horseback riders. 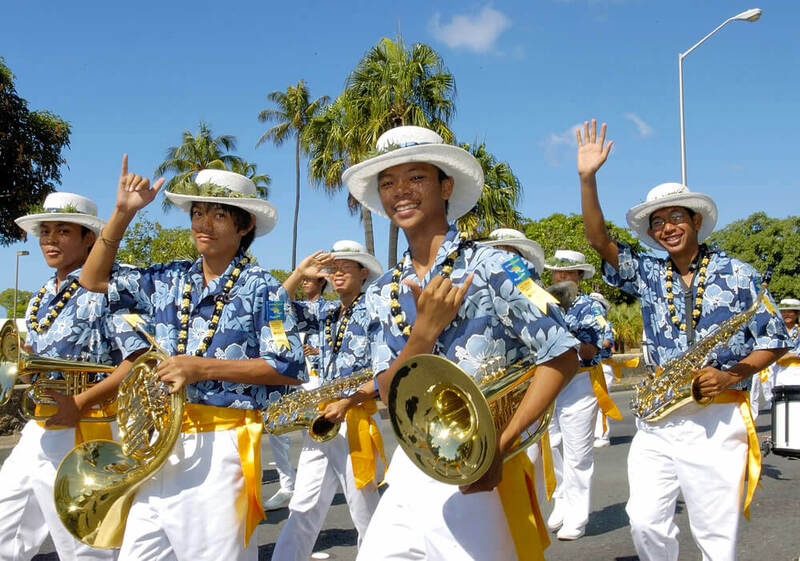 The procession is also riddled with all kinds of music performances, from hula dances to Hawaii’s own marching bands. The event represents one of the most important celebrations of Hawaiians arts, culture and tradition. Without a shadow of a doubt, the Albuquerque International Balloon Fiesta is one of the most spectacular and colorful festivals in the country. Its origins date back to the 1950s, when the event that involved flying hot-air balloons was originally set up to celebrate Albuquerque’s 770 KOB Radio. Over the years, the number of balloons that participated in the festivities kept growing and, in 2009, it reached a record number that counted 1,019 balloons in the air. 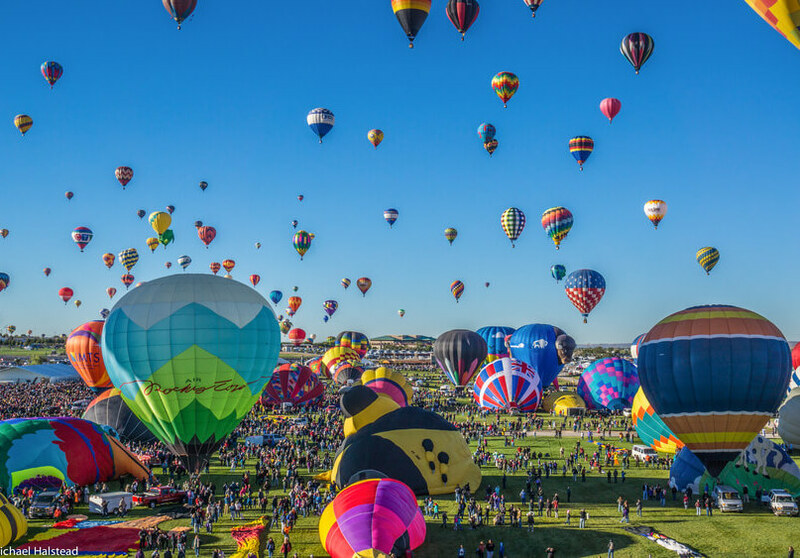 These days, the Balloon Fiesta, which is held every October, is the largest balloon-themed festival in the world and one of the most popular fall events in the US. The event begins in dusk, when a small number of balloons is launched to test the weather. The mass accession takes place midday, over a one or two-hour period. In the evenings, visitors can also admire the lit-up balloons as they paint the sky. Other than the traditional hot-air balloons, this event also features unique shapes and designs, from animals and symbols to famous cartoon characters. The event is also accompanied by music performances featuring prominent rock and country music artist. It should also be mentioned that the Balloon Fiesta is a dream come true for photography lovers; the sight of hundreds of colorful balloons floating above New Mexico’s prairies provides the perfect opportunity to make some jaw-dropping snaps. Taking place every first weekend in October, Hardly Strictly Bluegrass (once Strictly Bluegrass) is one of Nor Cal’s most popular festival. 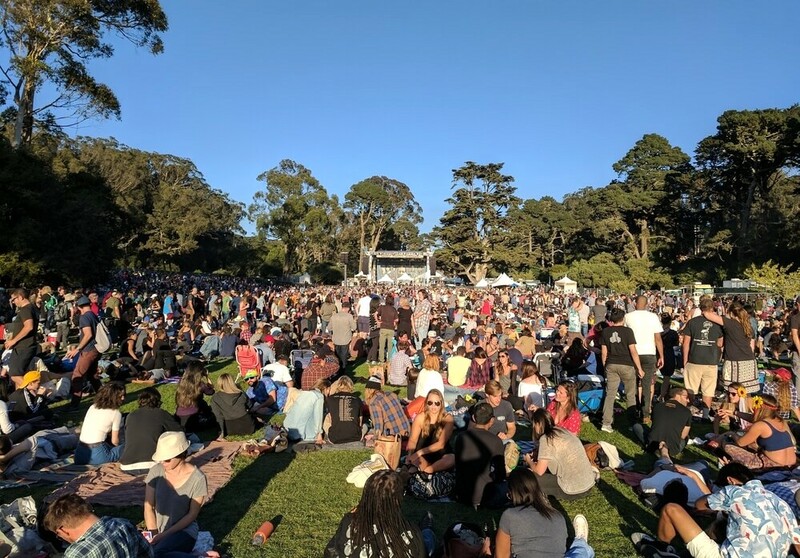 This three-day event, which is held in San Francisco’s Golden Gate Park, offers its visitors to see some of the most prominent acts in the sphere of guitar-based music – free of charge! Ever since its inception is 2001, this non-commercial event has strived to cultivate quality music and free-spirited attitude. The original idea was to only invite bluegrass artists, but the management decided to diversify the lineup in 2004, so the festival name acquired the attribute “hardly” to keep up with the updated music offer. 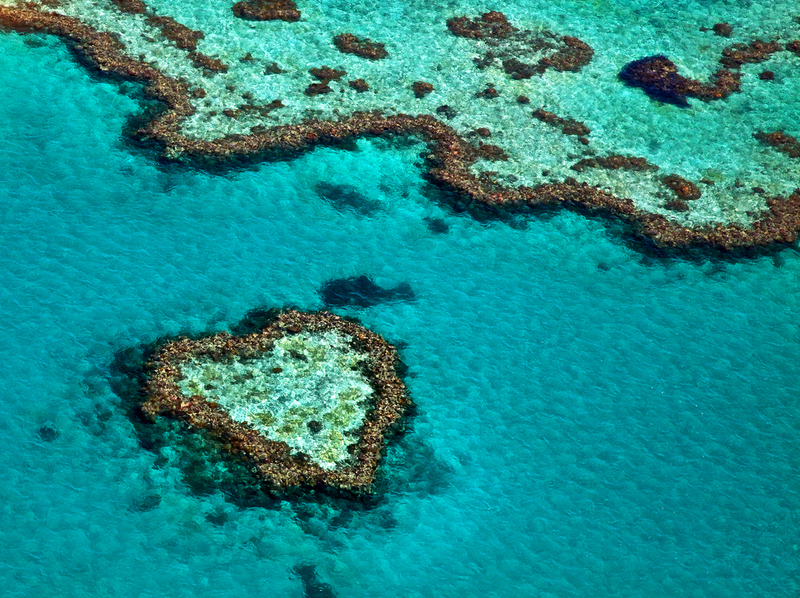 Because of its welcoming attitude, the festival is well loved by visitors and musicians alike. Acts that have been featured at the festival multiple times include Emmylou Harris, Connor Oberst, Nick Lowe and Moonalice. Therefore, if you like your live music soulful and gritty and you find yourself in SanFran this autumn, then paying a visit to the Hardly Strictly Bluegrass should definitely be a no-brainer. Autumn is the most important season for wine-making, which means this could be an ideal time to visit one of the lush grape harvest festivals, which are held across the country this time of year. And one of the most visited ones is the Sonoma County Harvest Fair, nestled in the picturesque vineyards of the most famous wine countries in the US. 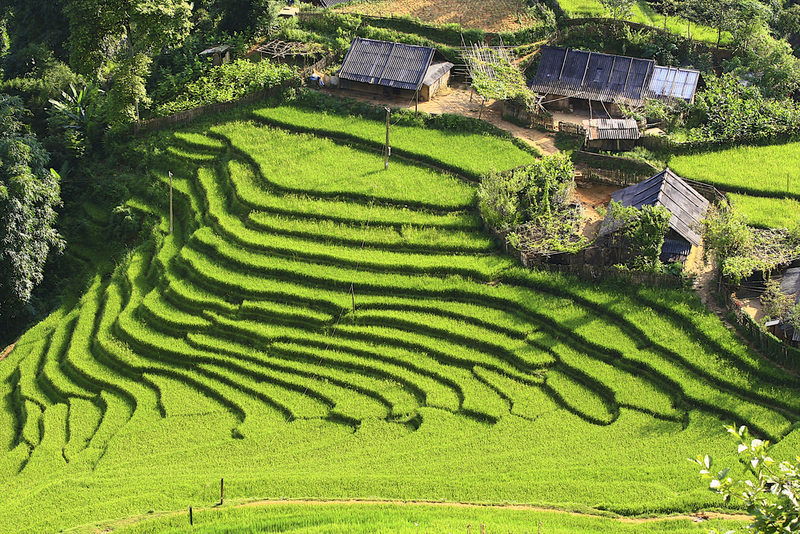 Each October, the district hosts harvest-related festivities in the idyllic town of Santa Rosa. These include the traditional grape stomp world championship, in which all the attendees can participate. Elsewhere, visitors can also indulge in wine-tasting or sampling the culinary palette, prepared by some of the most renowned chefs in the region. Sonoma County Harvest Fair also hosts cooking demonstrations, as well as wine tasting seminars for any and all budding wine connoisseurs. 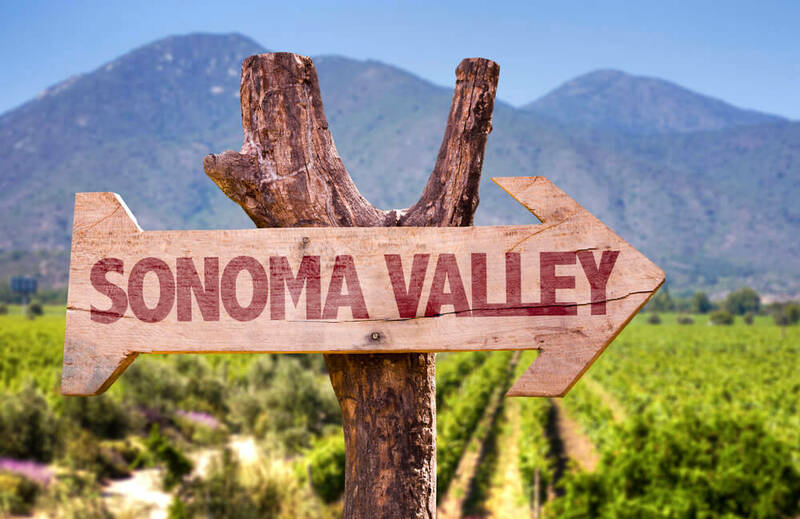 Finally, if you want to take home a souvenir to remind you of your delicious adventures, head over to the market, where you will be greeted with an abundance of award-winning wines, all produced in the Sonoma County. Alternatively, you can cop one of the hand-crafted trinkets that will make for great gifts for the folks back home. Perhaps the barren desert of Nevada isn’t the first place you’d associate with autumnal destinations, but this doesn’t mean it shouldn’t be on your radar in the season ahead. 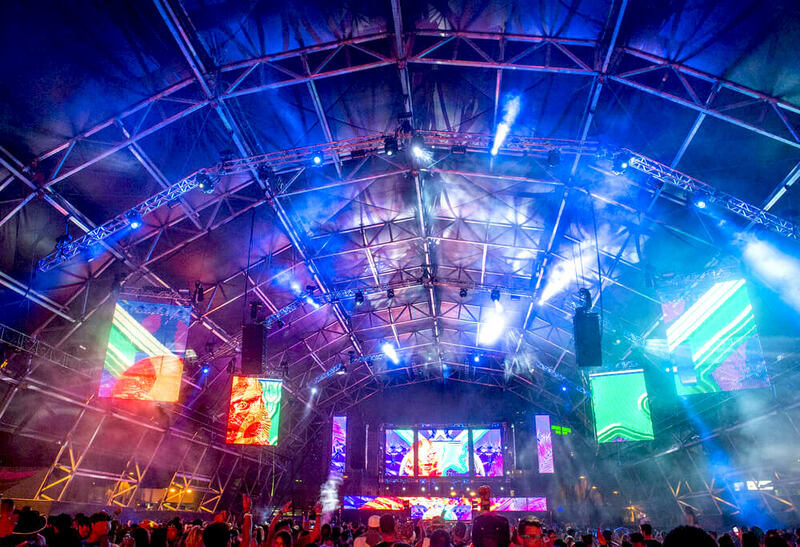 In fact, one of Las Vegas most prestigious music festival takes place in this period, offering a chance to anyone who finds themselves in Sin City during the fall months to witness some of the hottest music acts of today. Life is Beautiful Festival takes place in downtown Las Vegas in late September and lasts for four days. Each year, it draws top performers across genres, including rock, indie, hip-hop and EDM. To illustrate, previous headliners included Gorillaz, 2 Chainz, Muse, Lorde and Blink-182. Even though music is the main focus of this vibrant festival, Life is Beautiful offers a plethora of exciting accompanying events. For example, the festival also offers an opportunity to check out some of the most buzzed about names in comedy, including Michelle Wolf, Hannibal Buress and winner of RuPaul’s Drag Race All Stars, Trixie Mattel. Elsewhere, the festival also hosts a large-scale cookout, where world-class chefs present a new menu each day, each containing dishes cooked over sizzling wood fires. There is also the Cocktail School, where you have an opportunity to learn all the best-kept secrets of renowned mixologists. Art lovers will be able to check out intriguing murals and installations put up by local and international artists. Gather all ye who are looking to experience autumn as it once was! Now you have an opportunity to do so at one of the nation’s most colorful fall events – Maryland Renaissance Festival, the second largest festival of this type in the country. For this occasion, locals and visitors dress up in opulent medieval garb and take part in celebrations that take place over the course of nine weekends, from August to October. 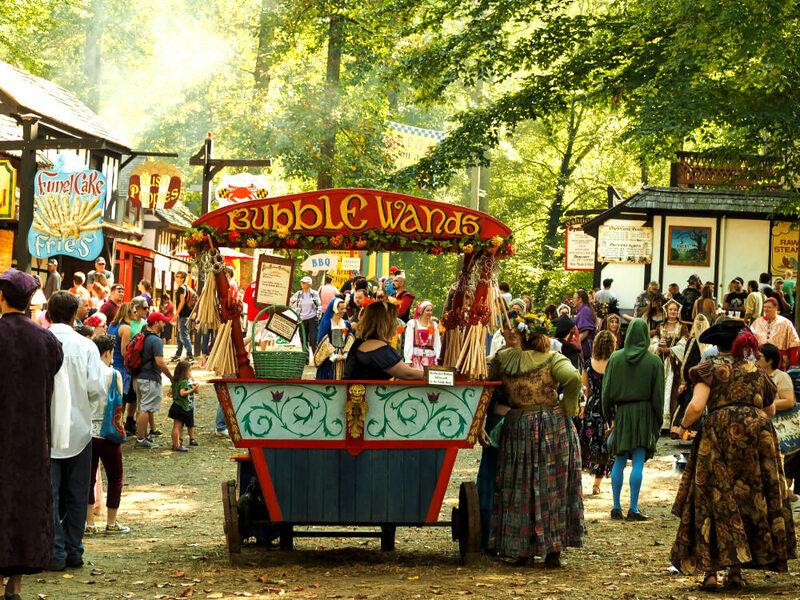 The Renaissance Festival is held in the town of Crownsville, in a recreation of a 16th-century English village called Revel Grove, which spans a whopping 25 acres of luscious meadows and woodlands. The fair is filled with over a hundred of food stands and craft shops. It also operates eight full-sized theaters, as well as several smaller stages that are located within the festival’s rustic taverns. The Maryland Renaissance Fair also contains a designated children’s area, in which the youngest visitors can also experience the magic of the medieval times. Each year, over 1300 performers partake in the jolly celebration, while festivalgoers get a chance to see all kinds of exciting sights, from catapult demonstrations to Tudor-era theater plays. Arguably the most famous harvest festival in the United States, this unmistakably autumnal fair takes place during the first two full weekends of October near the historic site of Gettysburg. For this occasion, Pennsylvania’s apple country hosts a variety of activities for both children and adults. 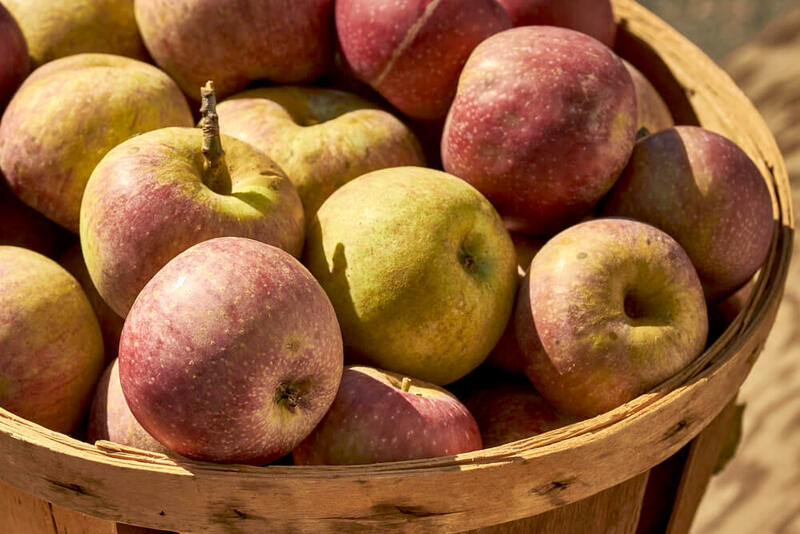 Before anything, National Apple Harvest Festival will invite you to please your palate by feasting on all kinds of apple-related treats, including apple jelly, apple pies and candied apples. For a different kind of entertainment, head over to the antique car lot, where you can admire all kinds of classic cars. And if you’re in a mood for something a little more interactive, you can challenge your competitive streak in one of the many carnival games that are dotted around the festival grounds. To see where it all begins, take a tour of Pennsylvania’s apple orchards and learn more about the apple growing tradition. Finally, you can check out one of the three hundred market stalls and fill your shopping bags with all kinds of apple delicacies and handicrafts to remind you of this fun-filled harvest festival. And with this, we round up our list of the must-visit autumn-themed festivals in the United States. 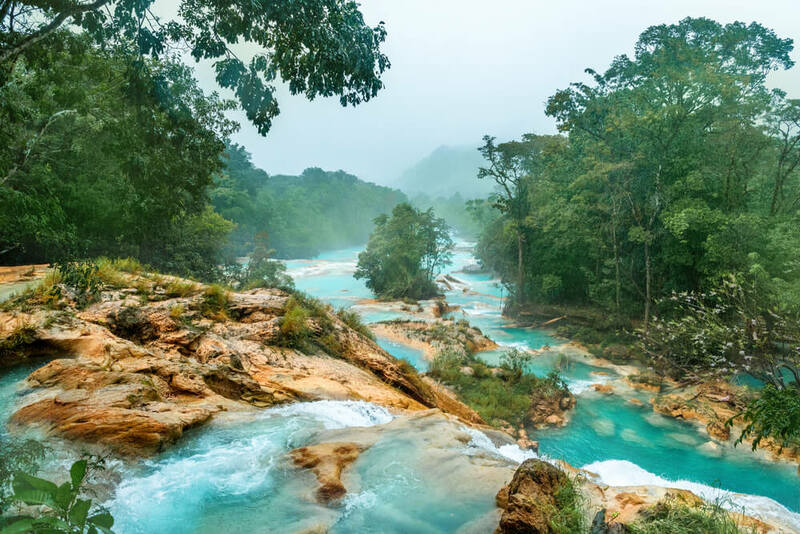 Whether you’re a fan of music, arts, wine or general fun and games, we hope these destinations will inspire you to make the first steps towards your ideal fall adventure.